"Welcome to Rowe's Produce Farm"
FOR DAILY INFO - JOIN "THE LIST"
Rowe's Produce Farm has been serving the Ypsilanti area for over 40 years. In that time we have grown to have the most acreage dedicated to u-pick strawberries and peas in the state of Michigan. During the summer and fall we operate a Farm Market and grow the best varieties of bi-color sweet corn available. So come on in and look around our site for hours, directions and recipes or just to see a few farm photos. You can also sign up for "THE LIST" on our Contact Us page to receive email updates on u-pick crop conditions and farm news throughout the summer. See you at the farm soon and have a very berry day! If you are thinking of coming to pick strawberries reading the U-Pick page can answer a multitude of questions. WE ARE SORRY THAT WE NO LONGER GROW U-PICK RASPBERRIES! Check out our NEW History page! You can now like Rowe's Produce Farm on Facebook ! Copyright© 2005 Girard's Produce Farm, L.L.C. 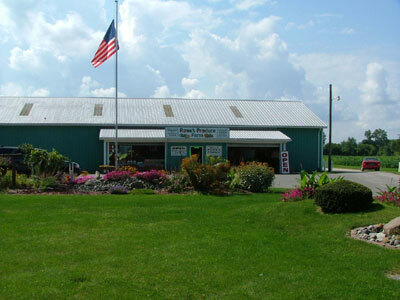 Rowe's Produce Farm is operated by Girard's Produce Farm, L.L.C.